Stressed about filing your independent contractor taxes? Don’t be. This guide helps you wade through the murky waters of contract work taxes to avoid tax penalties and maximize your deductions for a worry-free filing season. Being self-employed or having a part-time business has plenty of perks. But being your own boss comes with one big downside: tax obligations. And with the contractor and freelancer economy booming, more and more workers run the risk of underestimating how much they’ll have to pay in taxes by becoming self-employed. Actually, Intuit claims that “the gig economy will almost double to 7.7 million workers in 2020, up from 3.9 million today.”¹ If you’re one of these new contractors, follow these steps to file your taxes and maximize your return. To kick off your independent contractor tax filing, you’ll need to have all your 1099s from employers you’ve freelanced for during the year. You’ll also need records of your business expenses, including your business mileage if you drive a vehicle for your work. Then it’s time to jump in and get filing. 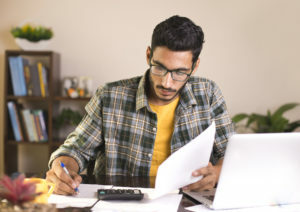 Whether you work full time as an independent contractor or just do a little freelancing on the side, these are the employer forms you need to track down to get the most out of your federal income tax return. W-9: When you’re first hired by a company as a contractor, you should fill out this form. It contains information your employer will need to create a 1099, which you’ll use to file your taxes. W-2: You’ll receive this form for any work done as a traditional employee. It documents your income, along with the taxes your employer already withheld from your paychecks during the year. 1099: This form documents how much income you received from companies you contracted with or did freelance work for during the previous year. Each company must send out their 1099 forms by January 31 (though it may arrive in the mail at a later date). Still confused? Read our guide to filling your taxes to clear up any filing confusion. Once you’ve calculated your income, you’ll use specific forms to file your freelancer taxes. These contract labor tax forms are called Schedule Cs and can be submitted on paper or online. Schedule C (also called a Form 1040): This is your independent contractor tax form. Use it to report your freelance income and expenses. Schedule C-EZ: Use this form if your freelance income totals less than $5,000 and you have no employees and no home office. Schedule SE: Use this form to calculate your self-employment taxes from a Schedule C.
Should you file annually or quarterly taxes? Regular employees submit their taxes just once a year, but independent contractors often pay taxes quarterly. By paying taxes quarterly, you can avoid large, end-of-year lump sum payments. If you’re new to receiving self-employment income, know that you could be penalized for not paying quarterly. Yikes. If you’re going to owe more than $1,000 on your annual taxes for self-employment income, you should make quarterly tax payments. A good rule of thumb is to prepay at least 90% of your current year taxes (or 100% of the amount you paid the previous year). If you skip quarterly payments and instead pay a lump sum for the entire year, you could owe a penalty for underpayment. In 2019, quarterly taxes are due on April 15, June 17, September 16, and January 15. Home office: If you use part of your home exclusively for business, you can deduct that cost. Education: Webinars, business books, seminars, conferences, and continuing education are deductible expenses. Car miles: This can be your biggest deduction. Track your business travel miles with a smartphone app to easily deduct them at tax time. Travel: For business travel, you can deduct flights, lodging, meals, and local transportation. Health insurance: If you pay for your own health insurance, you can deduct 100% of your health insurance costs. You can also write off glasses, chiropractor visits, and other medical expenses. Cell phone: If you use your phone for both personal and business use, you can deduct part of this expense. Can you get a tax refund if you file a 1099? If you have W-2 income, you may get a refund back even when filing 1099 income, but don’t count on it. The 1099 income is untaxed and will reduce or even eliminate your tax refund. If you typically get little to no refund, the 1099 income may make you owe additional taxes to the IRS. April 15 comes at you fast. If you don’t have your tax preparation done in time, file a free extension online. However, note that this extension grants you more time to file, but no extra time to pay taxes. Meaning, you have to pay on time, even if you don’t file the paperwork until later. You’ll want to estimate your taxes to the best of your ability and pay that amount online. It’s better to overestimate because you’ll be charged interest on anything you don’t pay. If you overpay, the funds will come back to you as a refund. The easiest way to file your free tax extension is visiting the Free File link on IRS.gov. You can use the free service to get an automatic tax-filing extension to October 15 on Form 4868. Know what you owe. Estimate the taxes you’ll owe for next year when doing your taxes for the current year. Set aside 20% of your self-employment income in a separate account for taxes. Keep your receipts. Put your paper receipts in a folder to keep everything organized, or try an app like Genius Scan to create copies of your receipts in the cloud. Track your mileage. Track miles driven for business purposes to help you calculate your deductions next year. Use an app that automatically tracks your mileage to help improve your tracking accuracy. When in doubt, ask a professional. H&R Block will give you a free Second Look review of current and past tax returns. Having an expert eye check for mistakes and missed deductions will help you maximize your refund. If all this tax jargon is too complicated, you may want professional help this tax year. You can work with a CPA, or you can invest in tax preparation software. Often, online tax preparation saves you time (and paper). Plus, online software often assists with tax deductions and double-checks your work to increase your tax savings. But finding the best tax software can be a challenge. TurboTax has the most reliable guarantee and features. Unsure about how you did? H&R Block has a Tax Pro Review feature to check. File your taxes online or at one of LibertyTax's many locations nationwide. Know what you're paying for with their upfront pricing. With the best price, FreeTaxUSA also has some surprising features. Do you have tips on filing taxes for your self-employed business? Share them in the comments below.